Summer Cadiz i Cádiz, Spanien : Boka nu! 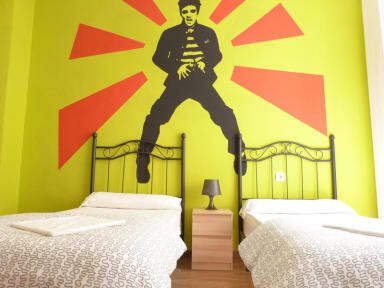 Me and my friend had a very pleasant stay at Summer hostel cadiz. Very friendly, safe and relaxed atmosphere. Never anxious about my belongings (we even left our phones charging in the dorm the whole day). The kitchen well equipped, everything very clean. We felt as if it was our home, easy to become friends with the staff and the other travelers. They have a big terrace where people gather in the evenings, and in the mornings breakfast (free). The location was perfect. I TRULY recommend! I swear this review with all top ratings is accurate as this really was a true gem of a hostel. Lovely, friendly vibe with colorful design and nice beds + fresh barhrooms. Such a nice rooftop too!